How can food be used to engage a social practice, in both a political sense and personal? Explore the theoretical framework surrounding socially engaged food art practices and how food and art can create participants in the engagement of ideas, politics and the crossing of social boundaries. Art and food have been layered conjunctively together for centuries. Still life, one of most classic iconographies, along with religious gestures of the Renaissance, has been dominated by food. Food in this way holds its own meaning, one of prosperity, fertility and abundance; a sign of wealth and upper class. An apple or bunch of grapes will still appear in contemporary art. However, in this essay, I’m not looking at how well an artist can paint food, or photograph it, as we see within the emergence of the “everyone is an artist” era thanks to social media. Rather, I’m examining and critiquing the role that sharing food can bring into the socially engaged art context. Sharing food is a practice that heavily dominates human nature (as well as in the animal kingdom, thus rendering the exchange as innate), so what we see in contemporary art: the socially engaged food art, isn’t new or vastly influential. Rather, highly depended on social interaction. The socio-political borders have to be pushed and renegotiated in order to create art that challenges the social norm. In the 1990s we saw artists who tried to question the expectations of the contemporary art goer, such as Rirkrit Tiravanija, the Thai artist who famously created Cooking Up An Art Experience in 1992. In this piece, the artwork was the result from the exchange of people sharing food in the art gallery, cooked up by the artist. However, this wasn’t creating a democratic space or utopia, rather it replicated the everyday in its banality. Today, in the contemporary art theory & history context, this work isn’t seen as ground breaking for socially engaged food art as Tiravanija hasn’t created a space critical of its social political context. Yet, it opened doors for the contemporary art scene to welcome new ways of looking at art, engaging with what Nicolas Bourriaud coined as relational aesthetics in 1998. Throughout this essay I will critique the artists: Keg De Souza, Suzanne Lacy and Linda Pruess, Coco Fusco and Nao Bustamante, as they navigate the socially engaged food art territory and explore their own versions of everyday experience. Highlighting the evidence that this experience is depended on those who share it and construct their own narratives within it. The first artist I will critically discuss is Keg de Souza who aims to engage the relational aesthetic framework in a contemporary art setting. Her socially engaged food art is developed within an institutional context, yet, rejects an exhibition format in the case of Temporary Spaces, Edible Places. Other manifestations of her works can be developed within the depoliticised space of a gallery or museum; however, Temporary Spaces, Edible Places creates its own space with a temporary tent or structure and thus demands its own ‘domain of exchanges.’ Through this new structure that often takes on the aesthetics of a tent, de Souza becomes the director of the experience, yet, opens the floor for the exchange of ideas in regard to colonialism and food placement within it. De Souza designs these spaces to to be shared with stories of culture and develops notions around neoliberalism to pose alternative spaces and knowledge platforms. Through this engagement, de Souza challenges the everyday and creates a critical space for the art viewer to contemplate their own placement within the arrangement. This theme is consistent in de Souza practice, she aims to create a utopian ideology in which food brings the art goers together, much like Tirvanija’s work at MoMA in 1992. We, as the audience and the participant, are left in a state of flux. De Souza creates a point of entry that breaks down the class binaries whilst highlighting and discussing them. However, when looking at de Souza’s work within Michel Foucault’s framework on spaces, you can’t ignore the oppositions that intuitions and practice work with, and against. Can food act as a medium between the art institution and the audience, and thus, create participants who challenge the capitalist norm of everyday life? As mentioned in the last paragraph, de Souza is the director in the beginning of her “performance,” she brings the food to the space and marks the dishes with flags. Drawing attention to the direction she wants the focus to be in. How far does this style of art making lean into Bourriaud’s demands of art that acts as social interstice, taking a “theoretical horizon on the sphere of human interactions and its social context?” De Souza aims for the utopian idealism of the contemporary socially engaged artist, constructing her own interstice, framing the exchange and the higher gain and thus the value in the artwork. Her work comes with flags, logos, icons and signs and she literally acts as the mediator of links between the participants. Creating a map, connecting their bodies, and “collapsing pseudo-aristocratic conception of how art should be displayed.” However, is this enough to form a Temporary Spaces, Edible Places community? As the artist, de Souza holds control of the types of food to bring, whether it’s cucumber sandwiches, Crofter’s pie or Kraft boxed mac and cheese. In an ideal world these discussions could be enough break down traditional hierarchies and class borders, but can it factor real change in the world? Are the locals she invites the one who were the colonised or the coloniser; and what role to we have to except in order to join the picnic in Keg de Souza’s temporary structures? Is the capitalist, ignorant, politician even aware of the micro-utopias that want to disrupt their lives? I acknowledge de Souza raises important questions surrounding colonisation; conversation of the traditional land; mega-gentrification; and displacement, but I question the effect a work like Temporary Spaces, Edible Places has on a world scale. Another art work that aims to bring the socially engaged food art practice about, in 1979 - 20 years before Bourriaud’s Relational Aesthetics – can be seen within Suzanne Lacy and Linda Pruess’ The International Dinner Party. In terms of the framework used in this essay, Lacy and Pruess’ work can arguable be seen as the first art work that engages the sharing of food in a political network. Their artwork manifests within the ‘domain of exchange’ and creates a world-wide utopian vision of feminist food art. 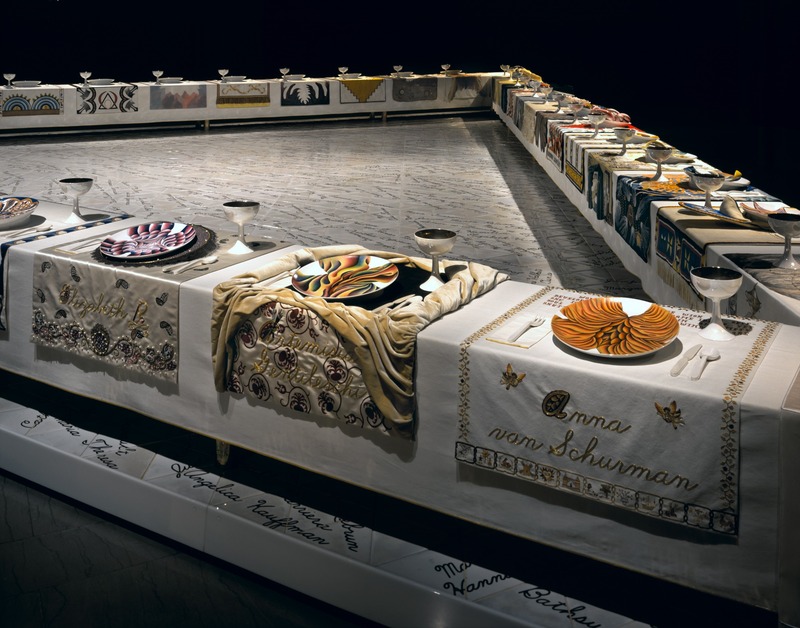 This work was created to go along side Judy Chicago’s Dinner Party, 1979, yet, instead of Chicago’s sole artist; individual construct of her own history; one that ignored intersectional feminism and thus, renders its self as elitist on a global feminist art movement. Lacy and Pruess disrupt the classic dinner party, and its connotations to women’s role in the kitchen and the household, to bring women from across the world together to create a map of exchanges. The International Dinner Party sought to break down binaries and boarders of class and race and gave movement to female solidarity. In The International Dinner Party women’s rights became the topic of the table within a world context. Like de Souza, they opened up the process of sharing food, and acted as performer to facilitate the conversation. However, as Lacy and Pruess were only bystanders to the global dinner parties, they completely render control to the audience to construct their own conversations. For this domain of exchange Lacy and Pruess collapse the distinction between performer and audience, and re-centre the emphasis on collaboration and the collective dimension of social experience, an element Claire Bishop believes is key to the art of participation. However, unlike a typical dinner party, Lacy and Pruess are still at the helms of the artwork, thus adhering to Walter Benjamin’s notion of art that “should actively intervene in providing an model for allowing viewers to be involved in the processes of production.” The artists invite the audience to create their own translations on their model and the audience feed that back into the overarching artwork through sending telegrams over a 24-hour time period to the San Francisco Museum of Modern Art. Lacy then went on to map the locations of the dinner parties, bringing the global participation back into the exhibition space. In this Lacy and Pruess, and the 2000+ participants of the artwork, create a heterotopia. A collective society is formed through the exchange, unique to its own time and place. The literal representation of the work could be replicated, however, never in the same way due to the unique conversations and meals cooked of the 1979 edition. So how do Fusco and Bustamante link back to socially engaged food art if they sought to reject notions of sharing? Within this rejection they create a heterotopia, the space becomes symbolically charged and thus allows for the social and political relations to be reconfigured. Fusco and Bustamante give the audience roles to play, thereby projecting the “other” onto their chosen participants. They are in control of the performance, and by doing this in cabaret, over a democratic sharing space, they “rupture static notions of identity and theatrical space.” The artists acknowledge, unlike the previous artworks, that contemporary space isn’t desanctified and a network of knowledge is needed to be able to create a utopian space.Stuff, moves art into the relational sphere by problematizing it, and thereby examines the ethics of the gaze and what we consider democracy. Claire Bishop wants us to ask questions when considering participatory art, such as “does it allow me to exist as I look at it, or does it on the contrary, deny my existence as a subject and does its structure refuse to consider the Other?”Stuff can’t predict it’s audience as it travelled around the world, yet it consistently “illuminates the persistent desire for ethnographic display.” Highlighting their expectations and desiring of the other, but by pulling the audience into this discussion, a collective dimension of social experience is created and calling for spectators who are active as interpreters. Food and sharing can be incredibly powerful, through its construct of the basic everyday. When you look at the social activity that arises from food sharing, it creates an area for women to feel safe and sociable. Examples such as The Country Women’s Association of NSW who sell recipe books to raise money for helping women in NSW, as well as education grants, disaster relief fund and medical research are ones which literally bring people together but the documentation of this can be used within the art frames I’ve discussed in this essay. However, as shown through the example of Coco Fusco and Nao Bustamante’s Stuff; the othering of food can be linked to the politics of spaces. Food isn’t always a safe place of sharing in socially engaged art. Art should challenge and contradict the status quo. Leaving you feeling unsafe and unwelcome at times to force you to reflect on your own standing and position within the world. As shown throughout this essay: the tension can be the art that is created from the exchange of sharing food. Socially engaged art can be a place of social interstice, creating new realms that open the framework for a Marxist driven equality. Yet, the artist must take responsibility for that, and recognise that a democratic space isn’t democratic space for everyone.